Join Us!!! We are looking for someone to help us cover High School basketball. Please send us an e-mail. After playing professionally in Lithuania, Lamelo Ball (6'5''-G-01, agency: Slash Sports) is returning to high school basketball and will enroll at Spire Institute in Ohio. "I'm excited to return to school and rejoin my class on the court for my senior year," Ball told SLAM Magazine. "Playing in international competition was a great experience. I learned and matured so much. I appreciated the JBA experience my dad provided for me. I think it helped my development. I can't wait to play with my peers." Justin Brantley, Spire's associate academy director, told ESPN that head coach Jermaine Jackson has trained Brandon Ingram, who plays with Lonzo Ball on the Lakers, the past few summers. He said that relationship helped bring both sides together. "My understanding is [LaMelo] was looking to relive that high school experience, looking to really focus on his game, as well as his education, and graduate," Brantley said. "It's more so of a feeling-out process to make sure it was the right fit all the way around, make sure we can help him, make sure we can provide him what he needs socially. "Basketball is the furthest thing from his mind [in this decision], because he can develop somewhere else. It's all the components that Spire provides." Ball was ranked as a five-star prospect in the class of 2019, but withdrew from Chino Hills High School (California) last October. 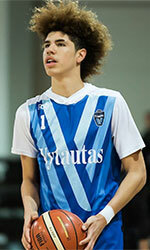 He and his brother, LiAngelo, then signed with BC Vytautas in Lithuania. The brothers returned to the United States this past summer and played in the Junior Basketball Association, a league run by their father, LaVar. Lamelo Ball will play for Spire's high school team (they also have a prep team) alongside Michigan State commit Rocket Watts and five-star junior Isaiah Jackson. "He's a scorer, he's a player, he's a facilitator," Brantley said. "I've watched games and seen him rebound. I've watched games where he gets players involved around him. I've watched games and seen him score. When you have someone that brings all three tools to the table, I'm ecstatic about it. It just really adds to the dynamic of what we're creating and producing here." Brantley told ESPN that Ball was not compensated and never received payment for playing in Lithuania or in the JBA, keeping him eligible to play this season. McAloon and the No. 4 Ascenders experienced another first on Saturday, knocking off No. 1 La Lumiere School (La Porte, Ind.) 66-55 to claim the national title. 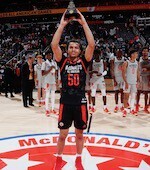 It's the first national title in any sport in the school's history and was also La Lumiere's first loss of the season. Josh Green (6'6''-SF-00) led the Ascenders with 19 points, Jeremiah Robinson-Earl (6'9''-PF-00), who was named tournament MVP, had 18 points and Jaden Springer (6'5''-F/G-02) posted 12 points, seven assists and five rebounds. Keion Brooks (6'8''-SF-00) led La Lumiere with 15 points and Isaiah Stewart II (6'9''-C/F-01) added 14 points and seven rebounds for the Lakers. Robinson-Earl had the hot hand early, draining two threes in the first four minutes to ignite an 11-4 run. Green scored 13 first half points, but Gerald Drumgoole (6'6''-SF) drained a corner three-pointer cut into the Ascenders 31-26 lead at halftime. Drumgoole drained another three with 3:22 left in the third quarter to cut the lead to 39-36, but the Ascenders countered with a 9-5 run capped off by Jarace Walker (6'6''-F)'s three-pointer to take a 48-41 lead headed into the fourth quarter. The Ascenders extended their lead, 61-51, on run-out dunks in transition capped off by Springer's transition layup with 1:23 left in regulation. Robinson-Earl said the historical impact was the most 'amazing' part of the win with so many quality programs at the school. IMG's football team finished No. 5 overall in the Super 25 this past season its baseball team is currently ranked No. 1 overall. The final Super 25 boys basketball rankings will be released on Monday.